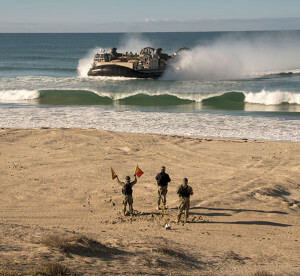 Marines with Weapons Company, 1st Battalion, 7th Marine Regiment, Twentynine Palms, Calif., perform Amphibious Landing missions at Camp Pendleton, Calif., during Joint Light Tactical Vehicle operational testing. Marines and Soldiers will finish testing the Joint Light Tactical Vehicle April 19 at the Marine Corps Air Ground Combat Center in Twentynine Palms, Calif. Soldiers from Bravo Troop, 1st Squadron, 33rd Cavalry Regiment, 3rd Brigade, 101st Airborne Division joined with Marines of Weapons Company, 1st Battalion, 7th Marine Regiment, to run the JLTV through its paces by conducting real-world missions in an operational environment as realistic as Iraq or Afghanistan. Testing began late February, and according to Randall G. Fincher, JLTV test officer with the U.S. Army Operational Test Command (USAOTC), 39 JLTVs in two variants of Combat Tactical Vehicle and Combat Support Vehicle were split, with 18 going to the Marines and 21 to the Army test units. “The Marines and the Army were equipped with both variants in the following mission packages: Heavy Guns Carrier, General Purpose, Close Combat Weapons Carrier, and the Utility version,” said Fincher. The biggest advantage to testing was the almost unreserved size of the MCAGCC training area and its harsh terrain, providing a true test of the vehicle’s maneuverability. “The Marine Corps Air Ground Combat Center offers us a large expanse of maneuverable terrain with hardball routes, secondary routes, and cross-country terrain in a realistic desert environment,” said Col. John W. Leffers, director of USAOTC’s Maneuver Support and Sustainment Test Directorate. “The terrain I see out there, is very indicative of what a Soldier or Marine would see in southern Afghanistan,” he continued. Leffers said the two particular Marine and Army units performing tests represent the JLTV’s primary customers. Marines with Weapons Company, 1st Battalion, 7th Marine Regiment, Twentynine Palms, Calif., run a Joint Light Tactical Vehicle (JLTV) down the road during JLTV operational testing at Twentynine Palms’ Marine Corps Air Ground Combat Center. Operationally realistic scenarios allowed the test unit Marines and Soldiers to tell the Department of Defense how well the system supports their mission execution. For the Marines, live fire and helicopter sling load operations, as well as a Marine Amphibious Landing mission at Camp Pendleton, Calif., were added to testing. One combined anti-armor team section leader Marine who has been deployed to Iraq twice, said training during JLTV testing was beneficial. “In terms of everything we did specific to Twentynine Palms and the combat center here — all of the scenarios — we’re pretty much experts at,” said Marine Sgt. McLennan S. Janes. “That’s all we do. That’s our bread and butter, in terms of movement to contact and conducting deliberate attacks, defense in-depths, and conducting raids and clearances. 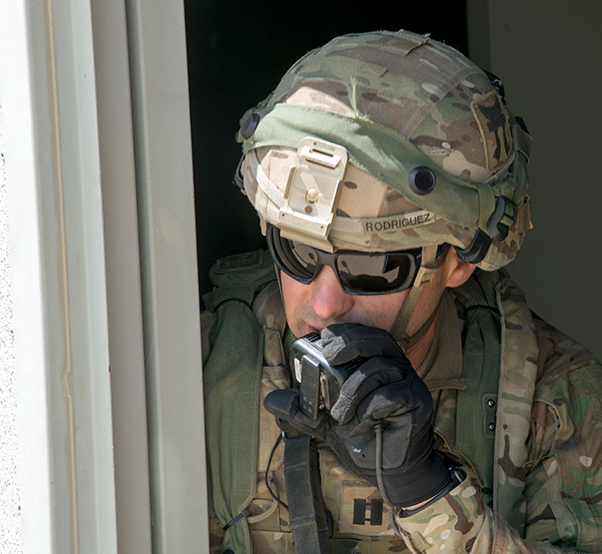 The 101st Airborne Division Soldiers from Fort Campbell, Ky., compared the MCAGCC terrain and size to much smaller training areas at their home station. Rodriguez said a Mounted Cavalry Troop is required to spread out over distances up to 15 kilometers and be able to shoot, move and communicate. “The main thing we can’t get at Campbell that we can get out here is the ability to do our mission over a great distance,” he said. “We’ve been doing long movements, we’ve been doing missions at distance, and we’ve been identifying enemy outside of our weapons range, which is ideal for what we want to do as Scouts — we want to identify the enemy outside of weapons range and use indirect fire instead of direct fire to disrupt their ability to operate. Rodriguez also said he welcomed the opportunity to be involved in an operational test without the normal distractions at home station. “I was able to look at all of my Soldiers and say, ‘Hey, your job is scouting for the next two months.’ That’s pretty valuable,” he said. One of Rodriguez’ platoon leaders said the training experience during the JLTV test will go a long way for him and his Soldiers. “Traversing in new terrain which is unfamiliar is just like being on a deployment and it’s a good experience for all of us,” said 1st Lt. Mike D. Towery. “Now, we have this knowledge base of what it’s like to maneuver in a desert environment, which will most likely be coming up for us, so now we have that experience in our back pocket. The operational test’s purpose is to collect data to be used to address operational effectiveness, suitability and survivability of the JLTV in its intended environment, according to Fincher. Capt. Michael D. Rodriguez, Commander of Bravo Troop, 1st Squadron, 33rd Cavalry Regiment, 3rd Brigade, 101st Airborne Division, communicates with his Soldiers, who were spread out over distances up to 15 kilometers during Joint Light Tactical Vehicle operational testing at the Marine Corps Air Ground Combat Center at Twentynine Palms, Calif. The Soldiers and Marines felt their opinions were being listened to and considered when test officers solicited their feedback. “It is a good opportunity to be able to work out the kinks, and provide the future generations in the Marine Corps with a vehicle that is going to be able to operate efficiently in combat,” said Janes. “After every test after action review, I would write about three pages and submit about 20 comment cards per week,” said Staff Sgt. Matthew A. Smith, 2nd Platoon Sergeant for the 101st’s Bravo Troop. 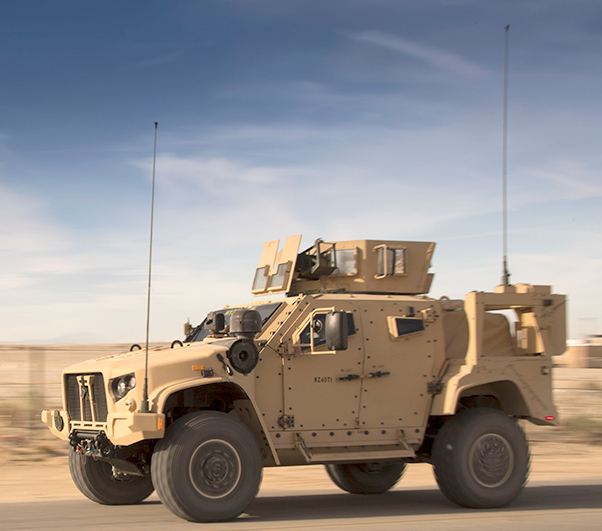 With 9-and-a-half years as a Cavalry Scout and five wartime deployments, Smith was content with giving his opinion on what works and what does not work with the JLTV. 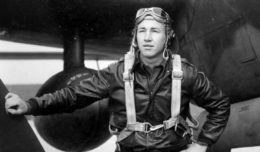 Smith said that while USAOTC Commander, Brig. Gen. John C. Ulrich was on the ground April 10, he felt the general listened to him with great concern. “A lot of the comments that I’ve made have been brought up,” he explained. “I was actually able to talk with the general one-on-one about some issues I addressed during data collection,” said Smith. “They’re definitely taking our recommendations. Smith said a lot of his Soldiers are young, and outside of JLTV testing, his troops got lots of training on battlefield operations. “At Fort Campbell, we focus more on dismounted and air assault tactics, and we focus more on the squad level,” he said. The Army, lead for the JLTV portfolio, plans to purchase some 49,000 JLTVs while the Marine Corps plans to purchase 9,000.